Trellising I - why bother? If you'd like to learn more about growing veggies in person, check out the classes offered by Madison FarmWorks and their Urban Gardener series of classes. It's one thing to read a blog post, it's another to get into the field, see their best practices in action and most importantly, ask questions. Tomatoes are part of the Solanaceae family. This family is also known as "nightshades," which includes potatoes, peppers, tomatillos and eggplant. (Good news, I took another class called "Solanaceae - everything but tomatoes" which if I get through this series in a reasonable amount of time, I'll also write up). 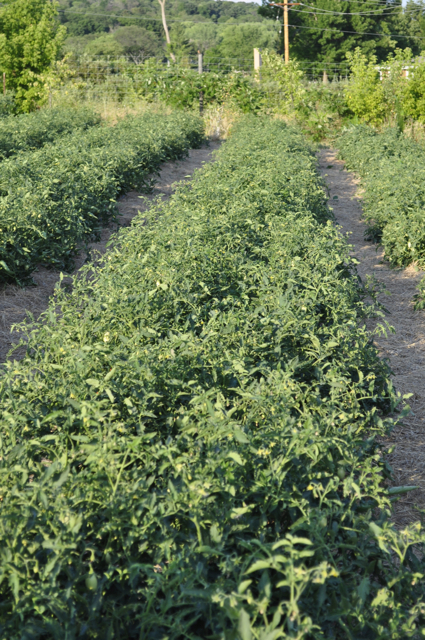 Tomatoes are generally heat-loving plants, but really prefer warm days accompanied by cool nights. In fact, tomatoes will often drop their flowers if hit with prolonged hot days and nights, like, say, this July. Originating in South America, the tomato was spread around the world following the Spanish colonization of the Americas. Read more about them on Wikipedia. "Slicing" or "globe" tomatoes are the usual tomatoes of commerce, used for a wide variety of processing and fresh eating. Beefsteak tomatoes are large tomatoes often used for sandwiches and similar applications. Their kidney-bean shape, thinner skin, and shorter shelf life makes commercial use impractical but make for a great home gardening variety. Plum tomatoes, or paste tomatoes (including pear tomatoes), are bred with a higher solids content for use in tomato sauce and paste, and are usually oblong. Pear tomatoes are obviously pear-shaped, and are based upon the San Marzano types for a richer gourmet paste. Cherry tomatoes are small and round, often sweet tomatoes generally eaten whole in salads. Grape tomatoes, a more recent introduction, are smaller and oblong, a variation on plum tomatoes, and used in salads. in Part 3, 4 and 5! There are two classifications of tomato, determinate and indeterminate. 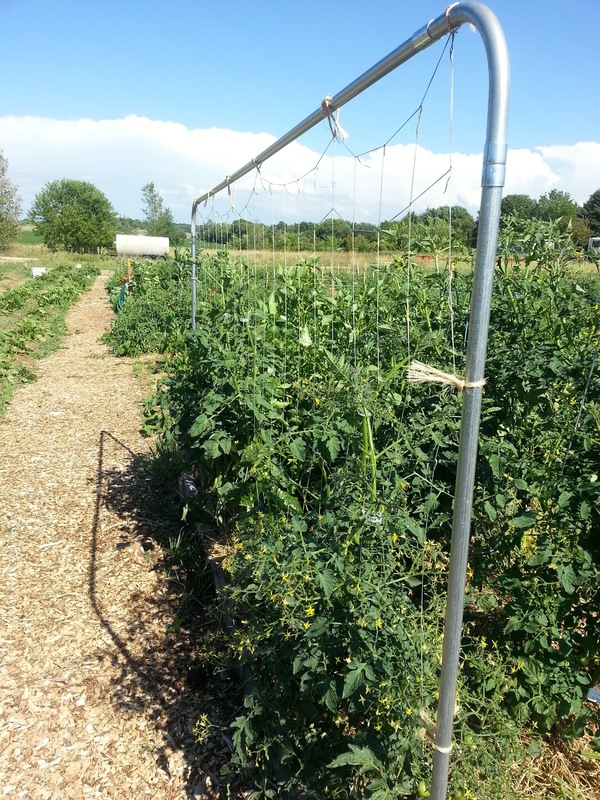 Determinate tomatoes tend to put energy into first the plant, then the flowers and then ripening the fruit, which tends to come at (generally) the same time. These are great for canning because you get a lot of fruit at one time. Determinate tomatoes are also called "bush" tomatoes because they stop growing up at a certain height (determined by the variety). Indeterminate tomatoes, on the other hand, are a wily bunch that, given the chance, will outcompete many varieties of zucchini. Before I knew how to reign in indeterminate tomatoes, I had a cherry tomato that had a wingspread of at least 25 feet. Indeterminate tomatoes need to be pruned, which I will hopefully get to before your plants take over your garden. These produce fruit all season long, which make them ideal for fresh eating or small-batch processing such as freezing or drying. Finally, it's good to understand that there are hybrid and heirloom seeds to choose from. Plants from hybrid seeds will carry on desired traits from the two parents, but the resulting seeds can't be saved from year to year because you never know what you'll get. Heirloom seeds will be true to their type, which means you are able to save the seeds from year to year and count on getting the same plant and fruit each year. The plants tend to be hardier, but the fruit tends to crack easily and sometimes aren't so "pretty. When planting tomatoes, it's a good idea to select the classification according to your needs (determinate and/or indeterminate) and a variety of species to ensure at least a few of your plants survive disease, pests or a drought, because not all plants are susceptible to the same things. If you liked this, please subscribe to the blog so you don't miss any of the rest of this tomato series! Love reading your blogs Josh. Miss your smiling face.